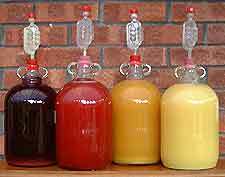 Winemakers have found that the basic equipment can produce an excellent quality wine, which includes flavour together with alcoholic content. This covers a wide array of wines including dry white wines, full-bodied red wines and sparkling wines. 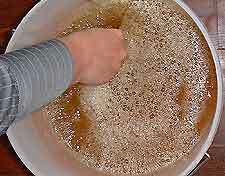 A large saucepan or container - enamel, stainless steel or aluminium but NOT brass, copper or iron. 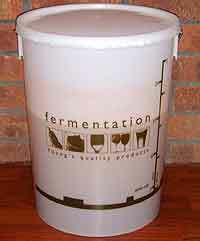 A glass jar (demijohn) for fermenting the wine, together with corks and airlocks. A metre of plastic tubing for siphoning purposes. Airlock - This will act as a barrier against the vinegar fly and vinegar bacteria. If the liquid becomes infected it will turn into vinegar. If you wish to calculate the strength of the wine and determine when to add additionally sugar, a hydrometer would be a useful piece of equipment. All equipment must always be scrupulously clean and sterilised, usually with boiling water or campden tablets.